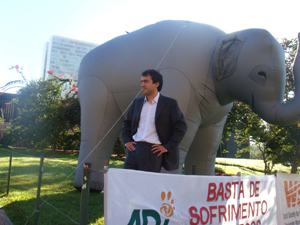 Animal Defenders International (ADI) is overjoyed that a ban on the use of animals in circuses is within reach in Brazil. Bill No. 7291, presented by the Congressman Antonio Carlos Biffi, has passed through the Commission of Education and Culture of the Chamber of Deputies in the Brazilian Congress. Following an intense debate with a strong presence of circus lobbyists and animal protection groups, the bill was unanimously approved in the Commission. •An elephant chained in a noisy and frightening environment, in a stadium with deafening engine noise and flashing lights. The bill bans the use of both wild and domestic animals in circus shows. The Commission compromised by allowing 8 years for the implementation of the law. The bill will next be discussed in the Constitutional Commission and then in the Plenary. This positive step forward comes very soon after the bill to ban all animals in circuses was approved by the Bolivian Congress and it is waiting for the Presidential assent to become a law. A similar debate was held in the Peruvian Congress, who last week passed a move to ban animals in circuses in the Agrarian and Andean Peoples Commission. The bill will soon be discussed in the full parliament.